1. Get the Edge at Roulette: How to Predict Where the Ball Will Land! With specialized backgrounds in two engineering disciplines, Christopher Pawlicki has been a highly sought-after consultant in the defense industry--and in this book he gives you, the roulette player, and the ultimate weapons to wage war against a seemingly unbeatable game. Pawlicki shows readers how to find and play biased wheels and how to recognize and exploit deep-pocket wheels that are more susceptible to bias tracking. He shows visual wheel tracking techniques and how to sector slice to increase the speed and accuracy of predictions. Also discussed is the new world of internet roulette and how it differs from the real-world game. Purchase this book at your local bookstore. Ever since having read R.D. Ellison's "Gamble to Win Craps", I have considered it to be the very best of the 20 or so books that I have read on the subject. This changed when I read his new (May 2002) offering - "Gamble to Win Roulette". This book succeeds on two very important levels if your intention is to win at roulette. Firstly, it contains a method of bet placement and money management termed 3Q/A Reverse Select that has been subjected to 7,500 actual casino spins, which resulted in a player advantage of 7.94%. For the price of printing and postage ($4.00) the author will send you the specific results of these spins. Does it work? This reviewer intends to find out. Secondly, as in his craps book, there is a wealth of practical advice from someone who has "been there and done that". It is the flipside of the coin (so to speak) for success - the realistic application of the method, which includes player psychology, getting started, playing the Internet, to name but a few. If you believe that a sure way to succeed at anything is to emulate those who have succeeded before you, and replicate their actions while heeding their advice - buy this book! I believe that the blueprint for success at gambling is contained within Ellison's book. If that is goal - buy it now! It's time for you to see for yourself, how to make thousands of dollars each and every week, discover new KILLER moneymaking secrets and learn about breakthrough strategies which will dramatically and instantly increase the amount of money you make doing what you love... playing ROULETTE. With this unique strategy you're about to learn, there will be no theories, no B.S., no outdated roulette techniques- nothing but down to earth, practical, and proven roulette strategy which will take your gambling experience to the next level at blinding speed. You're not going to be taught stuff that "sounds" good in theory but doesn't work in a live casino. You're not going to learn outdated ideas that just don't cut the mustard. 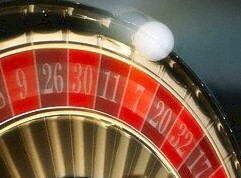 You ARE going to discover a proven roulette strategy and system that you can use immediately to increase your income. This is a no nonsense book that gets right to the point...WINNING. With the 14 number and the 8 number strategies, you almost can't lose. And by combining strategies and predictions, there are countless ways to win. My wife and I used these strategies in Las Vegas and Atlantic City, after doing the appropriate research of tracking over 200 actual spins, and the results were amazing. The only negative aspect of the book is that it takes a lot of time to MEMORIZE.... Pit bosses don't like winners who bring the book to the table if you know what I mean. By just picking a few of our favorite numbers, we were able to wait and hunt for our winners. Good Luck.... it always helps.